Time Capsule Mania!!! Can you believe it? That is honestly a phrase I never thought I’d read. So what does time capsule mania look like? Mostly a bunch of old dudes in suits and tricorn hats walking around with trowels on purple pillows. It’s pandemonium! The time capsule ceremony took place yesterday in order to replace a capsule originally assembled by Paul Revere and Samuel Adams in 1795. The historic cornerstone capsule was opened a couple of times since its original sealing, and was again opened last year during renovations at the Statehouse. What did the good people of Massachusetts decide to contribute to the time capsule? Some US Mint coins and a plaque. Crazy! More shocking photos of the ceremony from the Associated Press can be seen below. Just look at the manic revelry! Secretary of the Commonwealth William Francis Galvin, Massachusetts Gov. Charlie Baker, Lt Gov Karyn Polito and Grand Master of the Grand Lodge of Masons Harvey Waugh take a look inside the time capsule. Massachusetts Secretary of State William Galvin, left, and Gov. Charlie Baker, second from left, watch as Michael Comeau, front left, Executive Director of The Massachusetts Archives, and Pamela Hatchfield, Head of Objects conservation at the Museum of Fine Arts, replace a time capsule in a cornerstone. Roger Waugh, Grand Marshall of the Grand Lodge of Massachusetts, lights candles. 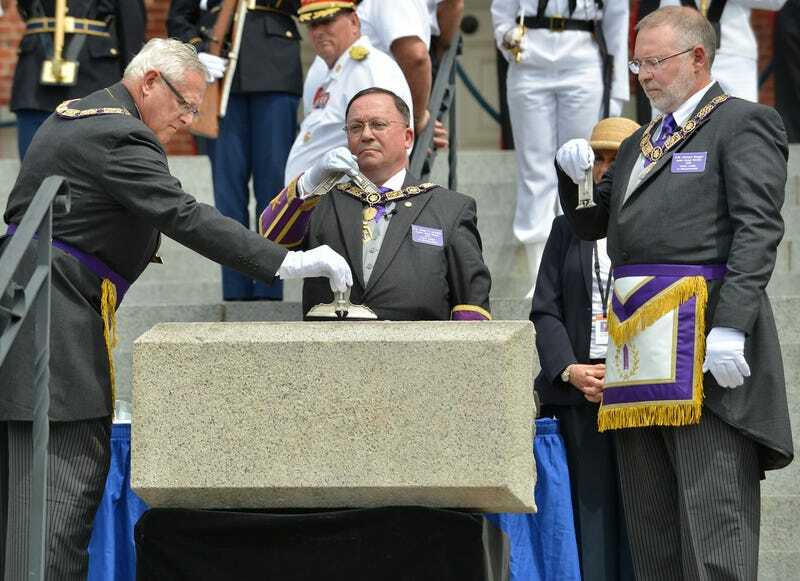 A procession of masons to a ceremony where a time capsule was placed inside the cornerstone at the Statehouse. Members of the Grand Lodge of Masons of Massachusetts carry ceremonial instruments. Time capsule MANIA, I tell you!